I recently took some time after a conference and spent the weekend in Seattle. Josh made note of our adventures in one of his recent posts. On that trip, with Josh, Kyle, and some alums from the places I have worked, we stopped at Airfield. bottles of wine, and the trip to Woodenville, Washington a couple of months ago was no different. Since Josh was gracious enough to be the DD, I took advantage and did the full tasting that was filled with both their whites and reds. Elise, Tara, Neil, and Stacey (the alums who were joining us), also participated in full tasting. That Saturday I would leave Airfield with 10 bottles - some would say "Why not just do a full case?" While I think about it, I just cannot answer that question with a decent response...shame on me! I fancy myself a fairly decent cook. I am always willing to try new dishes, and frequently do with varying degrees of success, and I have a few staples, which I am sure you all do. I also LOVE seafood, I grew up on it. Now that I live in the Pacific Northwest, I usually have seafood several times a week. One of the dishes I have been experimenting with are spicy stir-fryes. After coming back from Seattle, I decided I would try out another stir-fry for a recent dinner guest I had. I made a spicy shrimp stir fry that was had red, green, and orange bell peppers and asparagus. The stir-fry was then placed over rotini pasta. I am still fine tuning my rice cooking skills. Not going to lie - cooking rice still intimidates me a bit with the rice to water ratio and such. Anyway, I digress. In deciding what to drink with dinner, I decided to open the bottle of 2009 Airfield Thunderbolt Sauvignon Blanc. This was one of the bottles I had just procured during the above mentioned trip to Seattle. I could not have done a better pairing for this dinner! Both my dinner guest and I found that the balance between the chilled, dry, lightly sweet Sauv Blanc with the warm and spicy stir-fry dish was perfect. 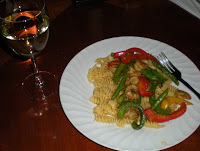 The Sauvignon Blanc was crisp and refreshing with hints of tropical fruit including lemon seemed to enhance the flavoring for the spices used in the stir-fry. The way it landed on the palate provided an alternative to the stir-fry. The Thunderbird was really just very enjoyable. I don't recall buying more than one bottle, but by the end of dinner, I definitely wished I had several. You will too after you give this bottle a try. A. I forgot that you bought 10 bottles! B. You should totally get a rice cooker. It's magical. Wine & Social Media; What's the Connection?